Why Do Trainers Use Food When Training? Training Tips Blog > Why Do Trainers Use Food When Training? Training pet dog behavior is for two general purposes—“do” and “don’t”: First is training basic manners, or “do”—to perform desired behaviors on cue such as “sit,” “down,” “come,” “stay,” and walk politely on leash. The other purpose of pet dog training is “don’t do”—don’t jump, pull on leash, run away, take candy from the baby and the like. Food can be a very valuable reinforcer (paycheck!) for dogs during training. It’s one of a very short list of things that dogs are born already knowing is good. While most dogs easily learn to enjoy praise, petting and play – all of which also make good rewards -- food still holds a special place in their mind due to its primal nature. If you ask the dog to do something, he does it, and you give him a treat, that treat is a reward. If you ask the dog to do something he knows how to do, a behavior that he has demonstrated repeatedly on request for a long period of time, and he doesn’t do it, maybe you ask again. If he STILL doesn’t do it, and when you then reach into your pocket and get a treat, and all of a sudden the dog springs into action to comply with your original request, THAT treat just became a bribe! You asked him to do it, he didn’t, you got food, and he decided to get to work. Good training strives to avoid this. •Use soft treats and make them small – about the size of a pea. Small, soft treats can be eaten quickly, which aids in your timing as a trainer. Using small treats allows you to be generous without over-feeding your dog. Dogs don’t care how big each cookie is; they’re more impressed by how many they get. •Try different types of treats. A dog treat doesn’t have to be labeled as such on the package. 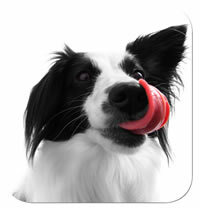 Bits of cooked meats, cheese, hotdogs, pasta, dry cereal and even fruits and vegetables can be rewarding to dogs. Experiment to discover what really excites him. •Remember that what’s exciting at home may fail in comparison to the distracting sights and smells out in public. Save your “extra special’ treats for training in distracting environments. •Get into the habit of petting your dog as you deliver the treat. Don’t simply be a Pez dispenser. When you consistently pair petting with treats, you raise the value of your touch. Now you have another way to pay your dog: petting! •If your dog has dietary restrictions and cannot tolerate many foods besides his kibble, you can use kibble for his training. To make it seem more interesting, put some in a baggie with a few chunks of cut up hot dog. The kibble will take on the hot dog smell. •Don’t over do it! The goal is to achieve a trained dog – not a trained, yet pudgy pupdog! Consider cutting back a bit on what goes into your dog’s food bowl and/or set aside a portion of his kibble and use that for training. For more information on the Association of Pet Dog Trainers, visit our Web site at www.apdt.com or call 1-800-PET-DOGS (738-3647) or email information@apdt.com.